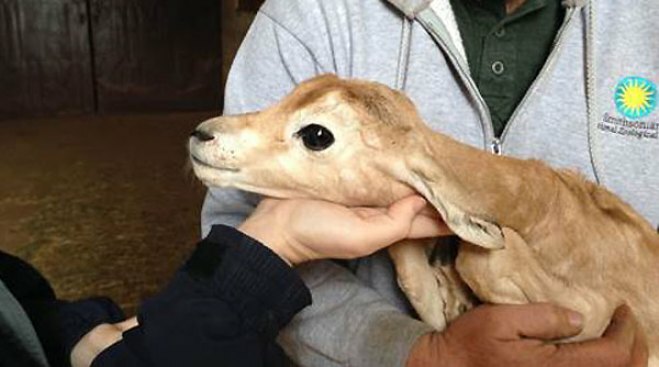 Three dama gazelle calves were born last month at the Smithsonian Conservation Biology Institute in Front Royal, Va.
Institute officials said the rare gazelles were born Feb. 18, 20 and 25 and, as of their 24-hour neonatal exams, the first calf weighed 11 pounds and the other two weighed 12 pounds each. Dama gazelles are considered the rarest species of gazelles. There are fewer than 500 left in the wild, and they are listed as critically endangered. The gazelles used to live all across northern Africa, but now are only found in Chad, Mali and Niger. The birth of these gazelles comes four months after a dama gazelle at the National Zoo named Tony was found dead in its habitat due to a fractured vertebrae. Zoo officials said they believe the gazelle broke its neck by crashing into a barrier after being spooked by a neighboring zebra biting a zookeeper.